I had the honor of being interviewed for the Library Chat podcast by Corin Haines of New Zealand while at the VALA conference in Melbourne earlier this month. Here is a full recording of our 20 minute conversation about library futures, key opportunities, and getting to solutions through the challenges. Listen to this episode, #16 on the Library Chat website or on iTunes. The Library Chat podcast series, “Conversations about the library world with professionals working in and around libraries” is hosted by Corin Haines, Manager, Digital Services, Libraries and Information at Auckland Council, Auckland, New Zealand. Check out Corin’s website and Twitter feed @corinh and make sure to subscribe to Library Chat and listen to other podcasts Corin did during the VALA conference and beyond. 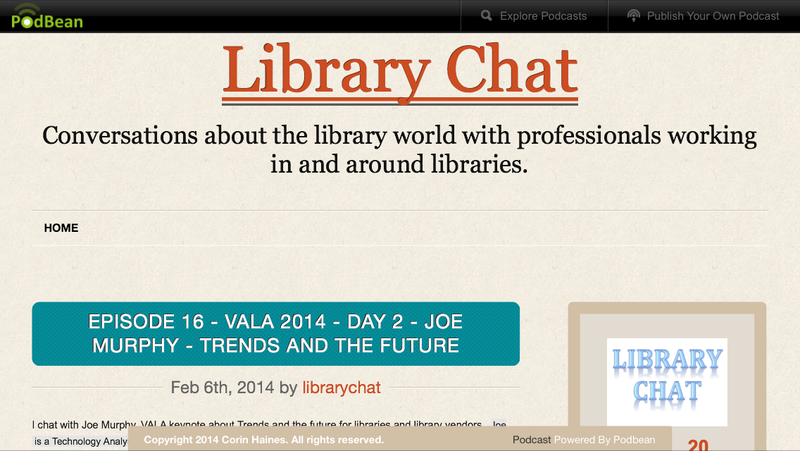 Corin asked me about the key trends I have my eyes on at the moment, we also discuss libraries’ approach to them. We talk about: how I help libraries in my new role as Director, Library Futures, the role and ratio of print in libraries, tech opportunities for libraries now, partnerships, strategies, drones, and more. All in 20 minutes and while I was still getting over a cold. Corin asked tough questions that deserve discussion as libraries move forward. I was asked about the things I did not see coming or things I saw strong potential in that did not materialize, leading to a fun and confessing discussion about strategizing for appropriate outcomes (exploring MySpace in 2007 for instance led to tangential gains of understanding the networked world). Corin made the great point that a helpful question is how can we help users gain the ability to understand how they can use tools is just as important as the question how can libraries use them. This conversation really complemented and supplemented my keynote, “Library as future,” (slides online). The interview was recorded during the 2014 VALA – Libraries, Technology and the Future conference in Melbourne which served around 1,400 attendees from the GLAM sectors from across and beyond Australia with cutting edge content at the beginning of this month. I had the honor of being one of 6 keynote speakers, the rest were phenomenal.